Listen to Joe Robinson's webinar on "Losing Your Head Leadership." Drawing from the life and character of the biblical "wild man," John the Baptist, author Joseph Robinson establishes seven imperatives in this concise and practical leadership resource. He establishes a common language and universal framework for discussing leadership in any setting. 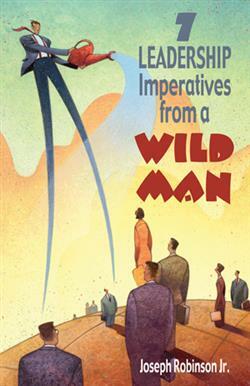 Suitable for use in both the Christian and corporate setting, 7 Leadership Imperatives from a Wild Man provides a new vision for leadership in the 21st century. "7 Leadership Imperatives From a Wild Man by Deacon Joseph Robinson is a best kept secret of wisdom and insight not only for men but for all followers of Jesus Christ. He is not a wild man as the title states, but to the contrary his unique way of revealing leadership principles used by well-known biblical personalities makes us say, since we did not see what he saw, that deep thinker is out of his mind! Deacon Robinson, is well read in history and literature. He has gleaned wisdom from his wide reading and from life experiences as an administrative leader. He shares these experiences in an entertaining way. Author, speaker, and real-world leader Joseph Robinson, Jr. is passionate about helping people identify and cultivate vital characteristics of leadership. Robinson conducts workshops and seminars on leadership topics, strategic planning, team building, and conflict resolution. Whether you lead in church or the community, a classroom or boardroom, there are some essentials you must know. Some might call them principles, but Robinson believes they are much more and has identified what he calls 7 leadership imperatives, gleaned from the life of the biblical figure, John the Baptist. In 2006, Robinson took an early retirement from his position as a senior division manager for the Commonwealth of Pennsylvania, to focus on a speaking and writing ministry to help equip others with the knowledge and tools they need to lead in their own world. His 26 years of public administrative experience provided him with a laboratory for implementing his 7 leadership imperatives. Over more than two decades with the Pennsylvania Department of Transportation, Robinson honed his supervisory, mentoring, and communication skills, and was certified as a quality manager through the American Society for Quality. He understands business and the challenges inherent with delivering quality products and services. As a deacon at his church, The Greater Zion Missionary Baptist Church in Harrisburg, Pennsylvania, Robinson also appreciates how leadership characteristics in the secular world translate into the church and ministry setting. He knows from experience that effective leadership at all levels is essential. Included in Robinson's varied experiences is having obtained his BA degree from the University of Virginia. An active member of the Alpha Phi Alpha Fraternity, Inc., Robinson also serves as Executive Director of the Martin Luther King, Jr. Leadership Development Institute. This program is an initiative of the Harrisburg Interdenominational Ministers Conference to develop emerging community leaders.